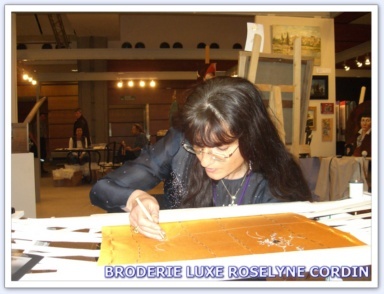 In the seventeenth century, many artisans-embroiderers were installed in Lunéville, which houses one of the residences of the Dukes of Lorraine. Around 1810, with the intention of imitating certain Dentelles de Flandres, Bruges, Venice and for a better differentiate, these embroiderers invents "POINT LUNEVILLE", a technique of embroidery on tulle, very light fabric , conducting a "chain" with a needle. Then in 1850, the hook is utilised, to embroider the "point of chain" more quickly. This tool offer a smaller "point of chain", with more specific grounds and valuable. 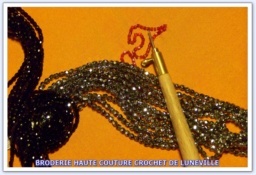 By 1865, Louis-Bonnechaux Ferry is the first in Lunéville who add beads and sequins. 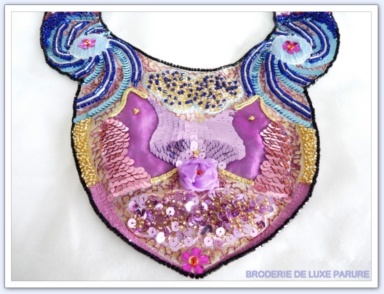 This innovation in the art of embroidery Lunéville causing a boom, and is used to make fine evening dresses refined sequins and shiny beads. In 1875, the black jet made a dramatic entry into the world of crochet embroidery, followed in 1891 by the glitter much lighter and brighter, which will revolutionize the world. But the First World War 1914-1918 slows seriously this craze. 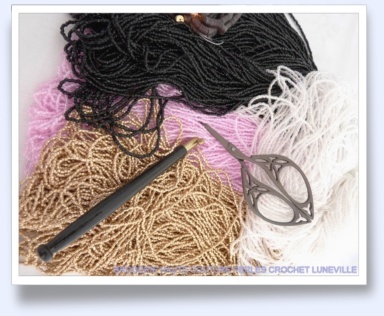 In 1929, an economic crisis deal a serious attack on the work of embroidery Lunéville and causing the closure of many companies. The Second World War 1939-1945 also delay the return of this art, which could see the revival only around 1950, by focussing on the manufacture fashion accessories (eg small beaded bag). Hook is prepared for a round of wood or ivory short end and ends with a metal end-piece called "door-edge" which fits the "peak", pointed metal rod and recourbée. This peak is maintained by a clamping screw dubbed "screw Violin." This screw is an indispensable element for the opening of the tip of the hook is screwed facing the screw, in order to pinpoint the location of the point where it is stitched into the fabric. 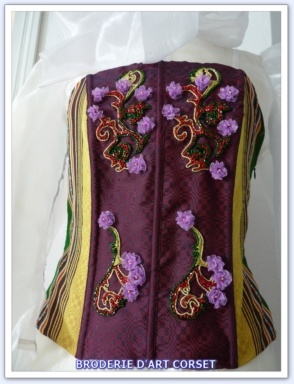 The fabric, tulle or organza or lace, is mounted on a trade embroidery set by drawstrings, so it could well extend its fabric, which is indispensable for the laying of beads or sequins. 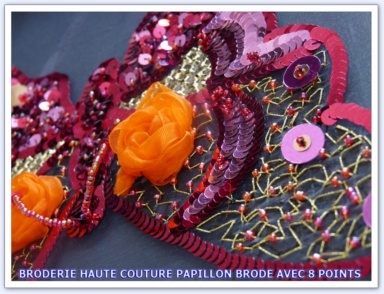 Today, in France, there are very few companies embroidery, and barely 200 embroiderers. 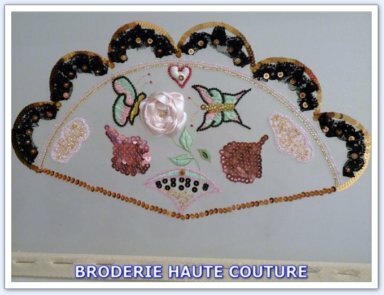 Mr Francis LESAGE of the House THE LESAGE-PARIS-, was THE Master Brodeur of the Haute-Couture, and embroidery lessons are very popular around the world. 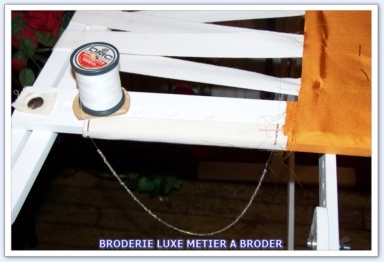 The technical of embroidery akin de Lunéville then the embroidery of Haute Couture, and Brodeur Lunéville provide homes Haute-Couture. It is a veritable institution since degrees are offered in vocational schools: CAP - BMA - DMAA. As the World of Show Businee or the biggest Cabaret in the world as The Paris Lido. It works "at the blind! The point is to hook on the back of the fabric. 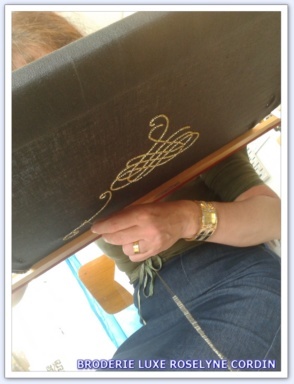 Every little pearl rock or straw is a point raised by the hook on the back of the fabric .